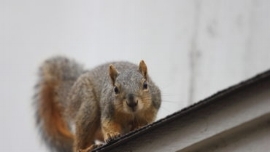 Are Mice, Rats, Squirrels, Flying Squirrels and other rodents and pest a concern? What can you do to keep them from coming into your home? Check out these tips to prevent a rodent infestation. 1. Clean up spilled food immediately. 2. Put away all food at night, including pet food and bird feeders. 3. Keep food, including pet food and bird seed, in sealed, airtight containers. 4. Keep garbage can lids tightly sealed. 5. Declutter your attic and basement, especially anything made of cardboard. 6. Store any items you can on shelves rather than in the floor. 7. Keep your yard clear of debris. 8. Keep grass and shrubs cut short. 9. Trim shrubs and trees away from the sides of your home. 10. Store firewood off the ground and a safe distance from your home. 11. Repair holes in your foundation, garage, and interior walls and any gaps in your roof. 12. Seal any openings larger than 1/4″. 13. Use rubber seals under garage doors. 14. Use door sweeps on exterior doors. 15. Use weather stripping around windows and doors. 16. Use screens that are in good repair on doors and windows. 17. Seal around pipes, drains, and vents. 19. If you suspect you have a rodent problem, contact a pest control professional.